Hedqvist, K.J. 1967. Notes on Megalyridae (Hym. 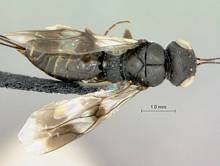 Ichneumonoidea) and description of new species from Madagascar. Annals Soc. Ent. France 3, 239-246.